As every reasonable person knows, there is nothing in the world better than being a good old-fashioned American patriot. Patriotism is the greatest thing any person can aspire to, especially patriotism for a great nation like the great United States of America. 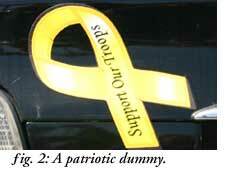 Unfortunately, not everyone knows how to be a patriot. There are some people who say that patriotism means becoming informed and getting involved in politics and government, which is nonsense, because who has time for that? Besides, that's what we pay politicians for. There are even people who say that criticizing the government is patriotic, as absurd as that sounds; reasonable people know that only traitors and Liberals criticize the government. After all, if everyone went around criticizing the government, what kind of country would this be? These ribbons let everyone know how you feel about good old-fashioned American values, like freedom, liberty, and bombing the holy hell out of un-American strangers in far-off lands. As with all things, though, anything that's worth doing is worth doing right. When you show your patriotism, it's important that you do it correctly. After all, you don't want to be a dummy, right? So we will now get into Advanced Sticker Placement, so you can show everyone that you're a patriot the right way! 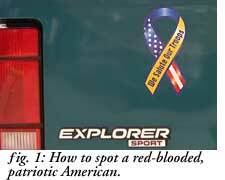 When placing a "Support Our Troops" ribbon on your car, it's important to get the little details right. Especially important is the issue of Sticker Orientation, or "S.O." Proper S.O. is vital for communicating the message of American patriotism and values. One temptation that you may experience when placing a ribbon on your car is to tilt the ribbon on its side so that the words are straight. Resist this temptation! This is not proper S.O. You must take care to get the S.O. just right; take pride in what you do! That's what made America great. Remember: sticker orientation is just as important as sexual orientation! The desire to make the text easy to read is understandable, but believe us, people will appreciate your patriotism much more if you place the ribbon the way it is intended to go. In fact, if you place the ribbon sideways and you aren't especially careful, you may actually end up with the words upside down! This is not good if you don't want to be a dummy. It might seem like you have no choice about placing the sticker tilted or lopsided, if there is not enough room on your car to place it right-side up. However, there is another solution. In situations where the sticker won't fit correctly if it is right side up, we recommend moving the sticker to a different place on your car. You will find that this often solves the problem very well. Sometimes, you might think that a ribbon belongs on its side because you may feel that it resembles a Jesus fish, which does properly face sideways. This is understandable, because a ribbon and a fish do look similar to the untrained eye. The pointed nose is a dead giveaway that something is a fish, not a ribbon. A ribbon is made by taking a piece of ribbon material and bending it in a loop, which produces a rounded curve, not a point. Another indication of a fish is that a fish may optionally have a person's name inside of it, which a ribbon does not, and (depending on the person's name) may have little feet as well. The little feet are useful to differentiate between different kinds of fish in case you do not recognize the name inside the fish, or in case you can't read. It seems like the owner must be a patriot, but look closely...in the lower left-hand side, you will see a flag that is not an American flag! It's a flag of a non-American country, probably filled with people who are not Americans! What troops does he support--American troops, or non-American troops from some non-American country? A man can not serve two masters, as they say. Watch out--it's a dangerous world out there!